The building's exterior is nearing completion. Living directly across the street from this project has been a treat, especially at 7am when crews start banging away at the scaffolding. Really amazed at how clean this site is compared to the mess over at Artspace. Saturday morning everyone agreed that Savarino has not been good to the neighborhood in terms of keeping that site clean. The pieces of broken brick that had fallen two weeks ago - just narrowly missing me - were still on the sidewalk. In sharp contrast, Eric and the whole LP Ciminelli crew have kept things in top shape over here. Last Friday while walking around both Artspace and Performing Arts HS with Stip, you may have missed these interior photos. I'd originally placed them in a slide show showing the latest developments at both project sites. Here's one of my first video attempts. A very short look at the renovation of the auditorium - right here. 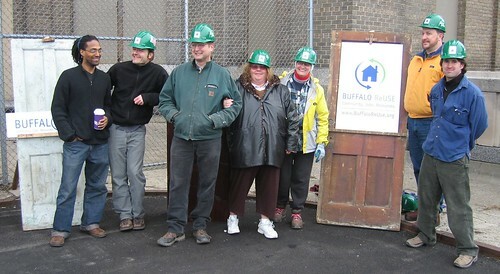 Caught up with Michael Gainer and the crew from Buffalo ReUse this morning at the Central Terminal. 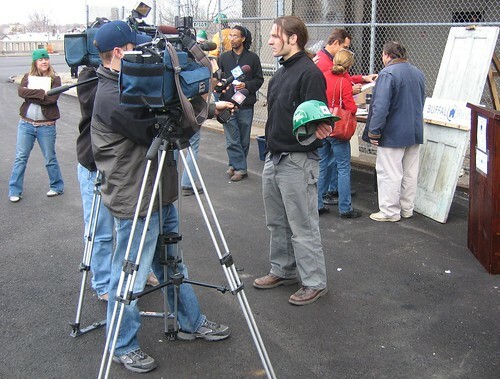 During the press conference we learned that Buffalo ReUse scored a major $187,000 grant and is setting up shop underneath the Central Terminal. This is a major step forward for Buffalo. 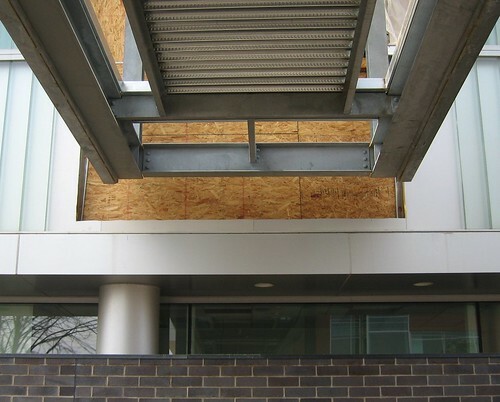 Reusing old building materials is not new. Intuitively it makes very good sense. First started thinking about this with Michele Johnson a few years ago. What is new and very exciting is Michael is doing it. He's catching us up with other parts of the country where this sort of activity is common place. While visiting friends in Vermont recently, I had an opportunity to check out ReNew in Brattleboro. Here's the gang, last October at 26 Lombard Street. 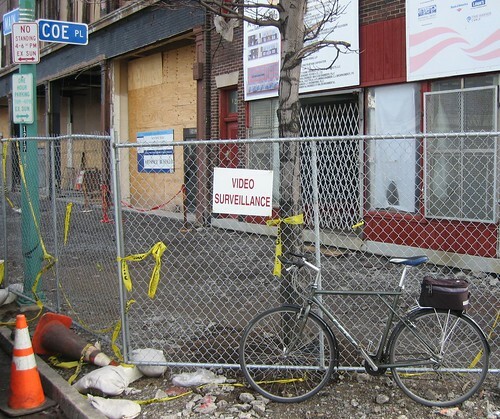 Follow that link for additional resources about deconstructing Buffalo. Just heard about the Lincoln Institute of Land Policy. Based in Cambridge, MA the institute is nonprofit and tax-exempt educational institution established in 1974 to study and teach land policy, including land economics and land taxation. Inspired by the work of Henry George as expressed in the book Progress and Poverty (1879), the Lincoln Institute introduces his thinking and ideas into the contemporary land and tax policy debate to advance a more equitable and productive society. 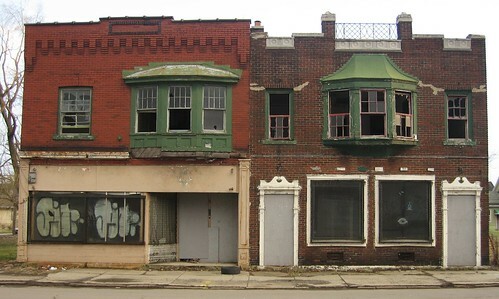 Their second film in a recent series - "Making Sense of Place" is called Cleveland: Confronting Decline in an American City (2006). It was released last Fall and aired on PBS. Just finished watching it...wow! We hope that the film will serve as a catalyst for discussion about the complex and sometimes contradictory issues that face cities - and the areas that surround them - as they move into the twenty-first century. While a primary goal was to provide the citizens of Greater Cleveland a vehicle for their discussions of these important issues, we believe that these topics are of similar concern to many other metro areas and hope that the film will inspire dialogue across the United States. Click through the links and you'll be introduced to an amazing collection of resources on urban decline and what is being done in Cleveland to combat this. Will do what I can to make this film available to a wider audience...stay tuned. Interesting note...the Center for the Study of Economics derives it's inspiration from the life and work of Henry George (1839 -1897) as does the Henry George Foundation. Both organizations support Land Value Taxation (LVT) as an alternative taxation system. The board game Monopoly is based on the teaching of Henry George. This weekend...Educating children from America's cities may be the toughest challenge urban leaders face. This week, we'll talk to three guests who are deep into meeting that challenge. Indianapolis Mayor Bart Peterson is the nation's only mayor who has the power to charter schools. His point person in setting up and running the chartering operation is David Harris who is with us this week. David and Mayor Peterson have been recognized for their efforts with an Innovations in American Government Award. Irasema Salcido is founder of the Cesar Chavez Public Charter Schools in Washington, D.C. The schools use each subject - even music -- to teach public policy. We'll find out from Ms. Salcido and music teacher Emily Isaacson about life inside a charter school. You are invited to attend an Open House at the Buffalo Artists Lofts building (1219 Main Street) on Thursday, April 19th. Artspace representatives will be there to provide you with the latest information regarding residential leasing of the sixty new affordable live/work units, and to answer any questions you may have. The session will run from 5:00-7:30pm. We hope to see you there! It’s rare that the words “city” and “farm” are uttered in the same breath. In Buffalo this might soon become commonplace. Rod McCallum, a community activist, has an urban farm in mind for the city’s near East Side. He recently laid eyes upon the mostly derelict block bound by East Utica, Purdy, Masten and Glenwood streets. 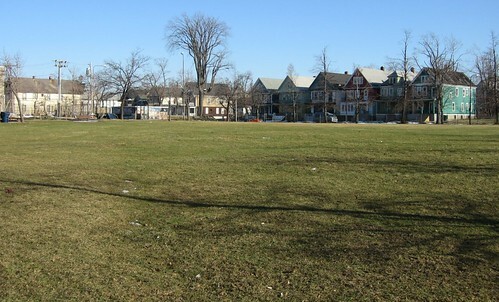 The block is dotted by boarded-up houses and vacant lots where many homes once stood. Walking along William Street the other day, towards sunset, I spotted these places. Know nothing more about them. They look totally cool and will be ready for the landfill or loft development one of these days. On Friday, after leaving Ulrich's, we walked through the medical campus, toured the interior of Performing Arts HS and walked around Artspace. Found it rather odd that Kaminski Park, next to Roswell was all locked-up. Anyone know why? Spotted these new signs all around the Artspace complex, too. Still sort of tough for pedestrians around the site. Check out the slide show for addtional pix of the new live/work units at Artspace. Love the black brick! Here's the slide show - Walking w/ Stip! Spent some time last week exploring a City park just down the street from my house. Charles Perkins Park is a little gem of place on East Ferry just past Jefferson. I really didn't know there was a tennis court so close to home. And the basketball courts, first rate. Really an amazing little park. Here's the map! Ten years in this neighborhood and my first time in the park...right across the street from the Hamlin Park Historic District. Oh...and the houses surrounding the park, all occupied! Yes, I checked. Last Fall I had the unexpected opportunity to begin an on-line correspondence with Lisa Schamess - project editor for Blueprint Buffalo. Wrote about our late nite IMing here - Connecting - in November. On her own she sniffed out what I considered to be my most inspired post, the one I wrote in February 2005 just having left a meeting at City Hall where the decision to re-locate Performing Arts HS to this neighborhood was made. 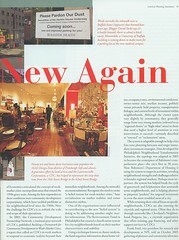 Lisa went on to write a piece "Everything Old is New Again," which appeared in the American Planning Association's December 2006 issue. Just scanned the full article - page 1, 2, 3 and 4. Yeah, I know...a little shameless self promotion. Just finished re-reading Blueprint Buffalo and love how Lisa described the local Buffalo blogosphere as - "a burgeoning 'pajama press corps' of citizen bloggers." Just received the latest e-newsletter from George Grasser and Partners for a Liveable WNY - March 26, 2007 George is adding hyperlinks to some of his commentary and notes for further exploration of what's happening here and around the country. Check it out. A number of our contact list members are participating in the Blueprint Buffalo initiative to address how to deal with the increasing number of vacant and abandoned properties in Buffalo and the first-ring suburbs of Cheektowaga, Amherst and Tonawanda. Four working groups are being organized to focus on specific parts of the vacant and abandoned properties problem. New members are welcome to join one or more of these groups. The groups are 1-Regional Real Property Information System, 2-Comprehensive Code Enforcement, 3-Right-Sizing and Greening; 4-Greyfields and Brownfields. There's something about barns that changes how I see things. They seem to resonate rather strongly with me. Saw this on Sunday on my way over to Koons Avenue. As a kid, I played in barns at summer camp and when I visit Vermont - Christmas 2006 - I stay with a friend who built her passive solar home inside an old barn. First noticed this yellow barn, while planning the Tour d'Neglect - 2006 a few years ago and promised myself I'd take a closer look. The style and design of this one structure in particular appears to echo some arts and crafts design. It appears to be in good condition. This yellow barn is located at the end of Mills Street near the intersection of Best and Genesee Streets. If you have any additional information about the design and who may have built this, please let me know. And if you have other Buffalo barn pix, like to know. Rod McCallum and his family were the first to show up on a cold November morning for the first Artspace Backyard Neighborhood tour. He'd seen this post - Saying Goodbye? 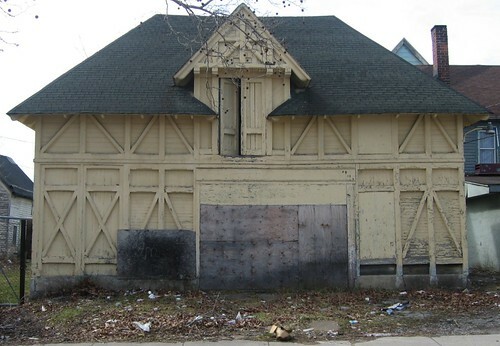 - on fixBuffalo and is now fully invested in accepting the challenge of re-purposing this amazing Queen Anne home and turning the vacant land surrounding the house into an inspiring and viable project for the neighborhood and "our Buffalo." Queen City Farm is now on-line. I'll be working with Rod later this week to tweak the Queen City Farm blog and bring him up to speed on the blogging thing so you can receive up-dates as they happen. Meanwhile connect with Rod if you'd like to contribute resources on a personal and/or professional basis. Queen City Farm will be located in the cross-hairs of a 50 million public investment in the arts and education here on the City's near East side. By this time next year we'll be adding Queen City Farm to the growing list of success stories from this part of the City - Artspace, BAVPA and the Merriweather Library! This Dominican Monastery is located at 335 Doat Street. Here's the google map and satellite pic showing the extent of the grounds. According to this short history of the Dominicans, The Monastery of the Lady of the Rosary was established in 1905 here on the City's East side. Sisters came from Belgium, back in the day. fixBuffalo reader suggested that I take a close look at the work of Philip K. Howard - the author of The Death of Common Sense: How Law is Suffocating America (Random House 1995) and The Collapse of the Common Good: How America's Lawsuit Culture Undermines Our Freedom (Ballantine 2002). Just found Philip K. Howard's Common Good Coalition and signed up for the e-newsletter. What an amazing advisory board, some of my favorite thinkers and writers are pushing this ball forward. Why did the New York City building code crush Mother Teresa's plans to build a shelter for the homeless? Why do your tax dollars pay for policing elementary school art displays? How did a handicap-access law deny public bathrooms for thousands of able-bodied people? America is drowning: in law, legality, bureaucratic process. Abandoning our common sense and individual sense of responsibility, we live in terror of the law, in awe of procedure, at was with one another. Philip K. Howard has written the explosive manifesto for liberation--one of the most talked about sociopolitical treatises of our time. Citing dozens of examples of bureaucratic overkill--everything from the labeling of window cleaner as a toxic substance to the U.S. Department of Defense spending $2 billion on travel and $2.2 billion processing the paperwork for that travel--The Death of Common Sense shows how far we have wandered, how we got into this mess, and how we can--and must--get out. Policy analysis here that requires a closer examination. I mean, if we keep doing the same thing over and over - ie, piece meal urban planning - and expect different results, well that's the height of stupidity right? Two years ago I began investigating a few houses owned by the City of Buffalo. Randomly choose 319 Koons off the list provided by the Division of Real Estate on the 9th floor of City Hall. Wrote about it here - Tumbling Down the Rabbit Hole, April 2005. It was the second time that I was "critical" of the City's failure to embrace market based techniques to sell it's ever increasingly longer list of real property. You know, using for-sale signs and dedicating a few web pages of the City's site to pix and descriptions. I visited 319 Koons three times in 2005 - April, May & July - and found this City owned house wide open. 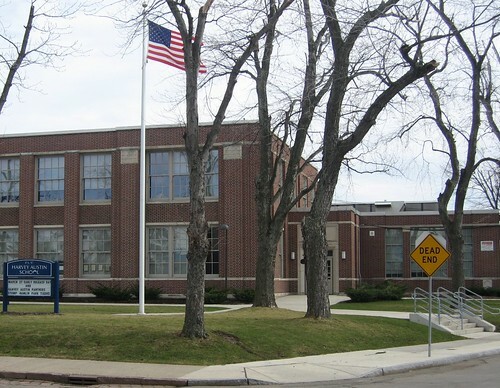 I expressed my concern to John Hannon, Director of the Division of Real Estate as 319 Koons is only half a block away from the newly renovated City school, Harvey Austin on Sycamore. I returned in 2006 and found the door wide open, still. Proximity of Harvey Austin School to 300 block of Koons Avenue - Google Map! Sunday afternoon I visited 319 Koons Avenue - delayed by the decay and destruction on Walden Avenue, see What if... - and was totally shocked and awed by what I discovered. One block away from the newly remodeled Harvey Austin school on Koons Avenue between Walden and McKibben there are 31 houses. 15 of these houses are partially boarded and wide open, including 319 Koons Avenue. I spent a couple hours here on Sunday afternoon. One neighbor that I talked to couldn't wait to get out and pointed to the partially burned house next door that was first torched two years ago. The Koons Avenue Shock & Awe slide show has more details and shows all the open doors and a few first floor windows. Every house that I poked around in showed evidence of having been stripped and used for all sorts of felonious activities. Last year, people lived here...today half the houses on the block were vacant. Many of the obviously vacant houses were boarded. The yellowish one - first pic in the third row - just had a broken porch window ( remember what Rev. Stenhouse learned at 121 Woodlawn, right here). Well you know the drill about broken windows, it's a down hill slide. The same neighbor told me that many of the houses that looked occupied were indeed vacant. A quick look at missing gas meters confirmed this. I was certainly not expecting what we might now call wholesale abandonment on Koons Avenue this afternoon. This is desolation. I didn't have the heart to walk the rest of Koons to Genesee Street. I'll do a proper inventory of this block soon. Regular fixBuffalo readers will recall that Michele Johnson - East side Housing Activist - introduced me to Koons Avenue in January of '05. She was calling attention to the decaying house owned by Hamilton and Lydia Woods of Redwood City, CA at 242 Koons Avenue, right here. That house was demolished at tax payers expense. Will try to find out this week if the bill has been paid. Last time I checked 6 months ago a bill hadn't been sent. 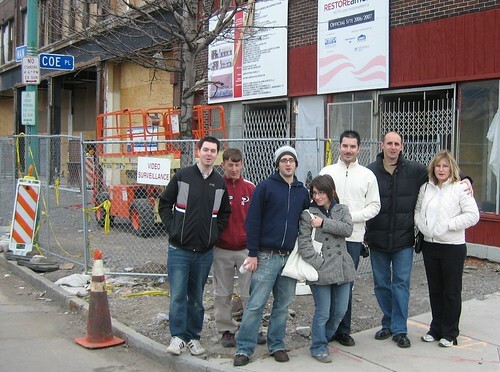 Remember Mayor Masiello's and Tim Wanamaker's Livable Communities Initiative (July 2004) that called for monthly monitoring of property around the City's new schools? Guess that was a waste of time and paper. Buffalo, NY - A Convenient Truth!